We’re heading into August flowers are in full bloom and we’re starting to schedule some classes to get you back into the groove. Have you heard of reverse Applique? Want to know more? We’ve got a class scheduled for Tuesday, August 8th and this is the little runner you’ll be making. Adding whimsy to your table or wall: We’ve mixed cotton, flannel and a wee bit of wool…some buttons and a small dose of embroidery. We have kits. Contact the shop to sign up. The woodland critter panel is set and ready to make anyone who sees them smile. What a fun sofa toss for Christmas. We still have room in our Snowman class. 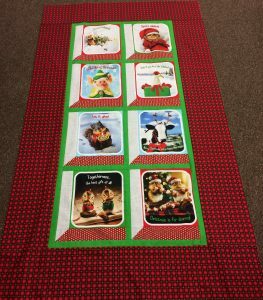 This project is done with cotton and flannel with applique and using the 6″ scrap crazy template. We have kits and room in the class if you’re interested, contact the shop to sign up. Next project I’m working on is two fold…..paper piecing and quilt as you go. If you don’t have a vegetable garden, no worries…we’ve got you covered on this one. (Hint). It’s approaching fast….the Annual Event of the Year….Falling Leaves Shop Hop. Mark your calendars now – September 29th – October 7th. All shops will be open Sunday (12-3). 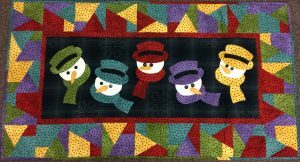 Participating shops; Busy Bobbin, Rice Lake; The Calico Shoppe, Eau Claire; Knot Sew Perfect, Deer Park; Pins n Needles, St Croix Falls; Quilters Corner, Clear Lake; the Quilting Nook & More, Osseo; and Thimbles. Each shop is giving out a “free” fat quarter and project pattern and all fat quarters blend into one exciting project. As projects are completed in each shop they will be posted on websites. I’m so excited. Have a stack of quilt tops at home and just don’t want to tackle on your small machine. Now and I really mean now is the time to check out the BabyLock Tiara. I have two I’m pricing at clearance prices. Come try one out and see for yourself just how fun these machines can be and you won’t believe how beautifully you will be quilting. Christmas projects completed in plenty of time. Enjoy your week and stop in when you can.